There’s been a recipe — or rather, several related recipes — going around for the past month or so. I got the pointer from Diane Duane (Tumblr here) and the original recipe is at Azriona’s LJ where she has been posting a Sherlock Holmes fanfic to which it is related. I’m not really a fan of fanfic (or even profic pastiches) but I am a fan of chocolate, so I had to try it. I learned a bit along the way. 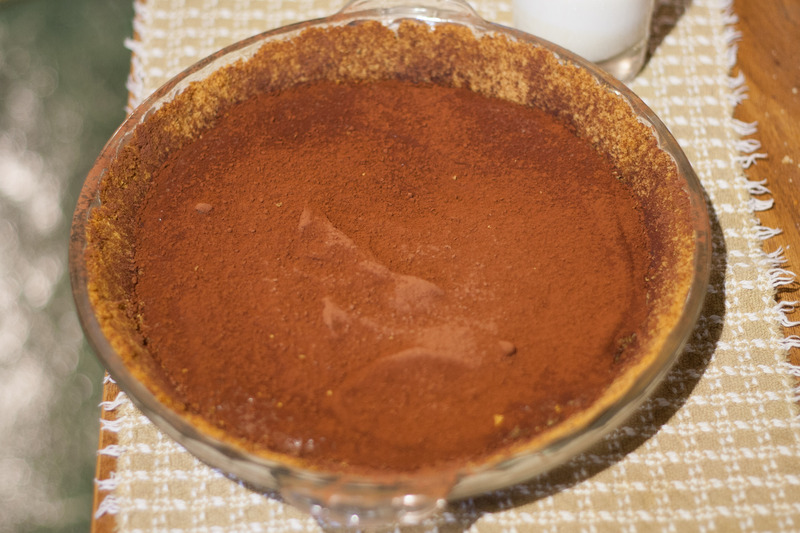 Azriona’s recipe leaves a few important details out; most notably, she doesn’t specify the size (or volume) of the pie plate or give a specific graham-cracker crust recipe. I checked a bunch of cookbooks and settled on the very simple crust in Christopher Kimball’s Yellow Farmhouse Cookbook . It just called for graham crackers, brown sugar, and melted butter, which suited my preferences. Of course, I had to buy graham crackers, and I knew I needed chocolate, milk, and eggs as well, so I went to the local Whole Foods (because I know they have good chocolate). The filling comes together surprisingly quickly, as DD notes in her adapted recipe. I had to make one other accommodation, besides using low-fat milk: I don’t drink coffee, don’t ever have any in the house, and quite frankly despise the taste of it. So I just used water where the recipe calls for coffee; in retrospect perhaps I should have made a cocoa slurry. Blog posts about food are always supposed to include photos, so here’s what the finished pie looks like. You’ll note that I followed DD’s advice and sifted cocoa powder across the top to keep that nasty film from forming (I happened to have some Valrhona cocoa in the cupboard so I used that). This was taken with a portrait lens, the widest-aperture lens of any in my camera bag, and it shows — the depth of field is paper-thin, leaving the central defect quite clear and the crust blurry. I’m a little bit disappointed in the overall chocolateyness of it. Some of that is undoubtedly due to my having left out the coffee; perhaps I should make a hot-water-and-cocoa-powder slurry to replace it rather than just plain old tap water. I think it might be worth using a higher-test chocolate, perhaps that Guanaja that I passed up at Whole Foods. But as I’ve had two slices now, I’m coming to agree with Diane Duane that the crumb crust competes a bit too much with the filling. There are no spices on the ingredients list of my graham crackers, but there is molasses, and of course the brown sugar called for in the crust also has molasses, so perhaps that part of it. 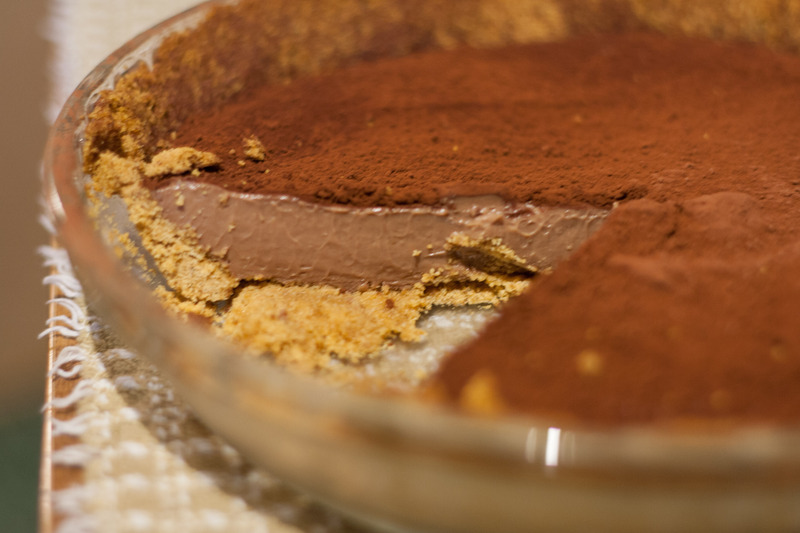 If I try this recipe again, I’ll make at least three changes: use a pastry crust, in a tart pan, with 70% chocolate rather than 64%. 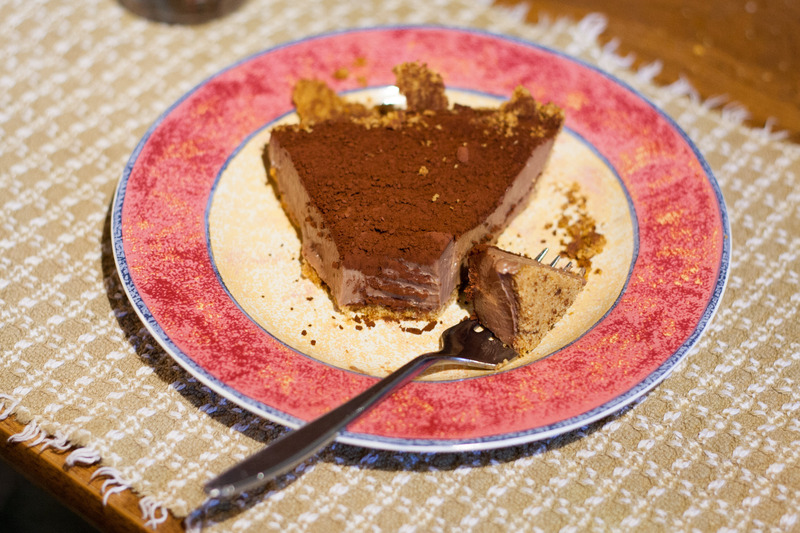 This entry was posted in Food and tagged chocolate pie, recipe. Bookmark the permalink.